No, I didn’t drop off the planet! I’ve just had a couple of crazy weeks! November 11, 2015 November 11, 2015 Kathleen AdamsLeave a Comment on No, I didn’t drop off the planet! I’ve just had a couple of crazy weeks! This is a birthday card I made for my sister Susie! This card is another pop up using dies from my favorite source Elizabeth Craft Designs. The picture above is the front of the card. I wanted to post this one because I made a mistake and had to think of a way to fix it because I had already put so much time and materials into it when I realized I had a problem. Do you see the top of the Eiffel tower sticks up over the top edge of the card? Well, I didn’t want to cut the top of the tower off so I had to figure out a way to make it look intentional. 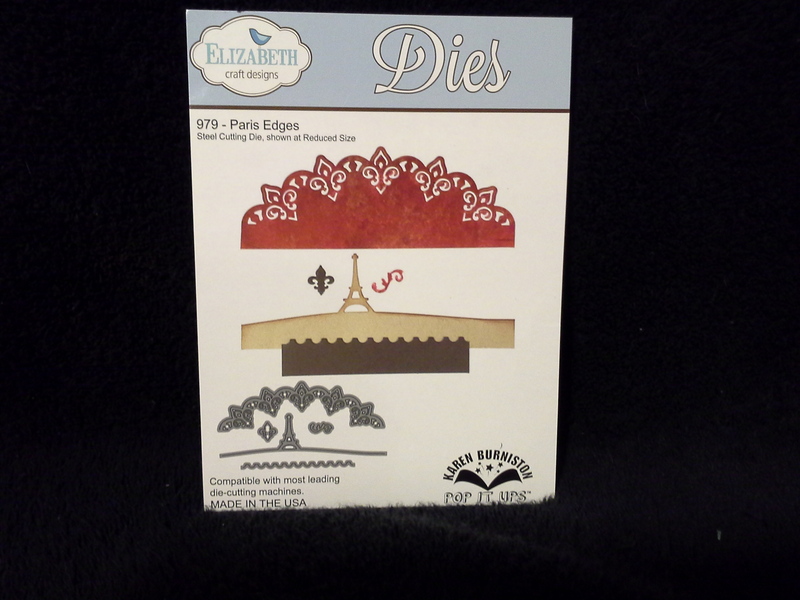 I fixed it by adding to the card using two great products in the Elizabeth Craft Designs line called “Paris Edges” and “Agatha Edges“. Shown below. I use these two products a lot. I love how this company throws in a couple of extra dies with many of their die products which makes the value even better. For example in the left picture above you see two little dies. One is a Damask element that matches the partial circle Damask and then the other one is a tiny flourish. Yea, who doesn’t love extras? I used the Damask element in the four corners of the card. The middle die in the picture to the right is what I used to create a longer card so that the Eiffel Tower’s point was protected when the card was placed in an envelope. The Paris Edge (again on the left) I used on top of the Agatha edge. You can use any of the “edges” series by running your proposed card through your die cutter to give the top and bottom edges of your card a certain shape. To start I cut a piece of white cardstock 6″ x 11″ and scored it at 5.5″. When the card is folded on the scored line it would measure 5.5″ x 6″. I used the Elizabeth Craft Designs die called “Lots of Pops”. I’ll bet I’ve used this die more than any other die I own. And, I own a lot. This is the die that creates all the levels for your pop ups. Below is a side picture of my card that shows all the levels. 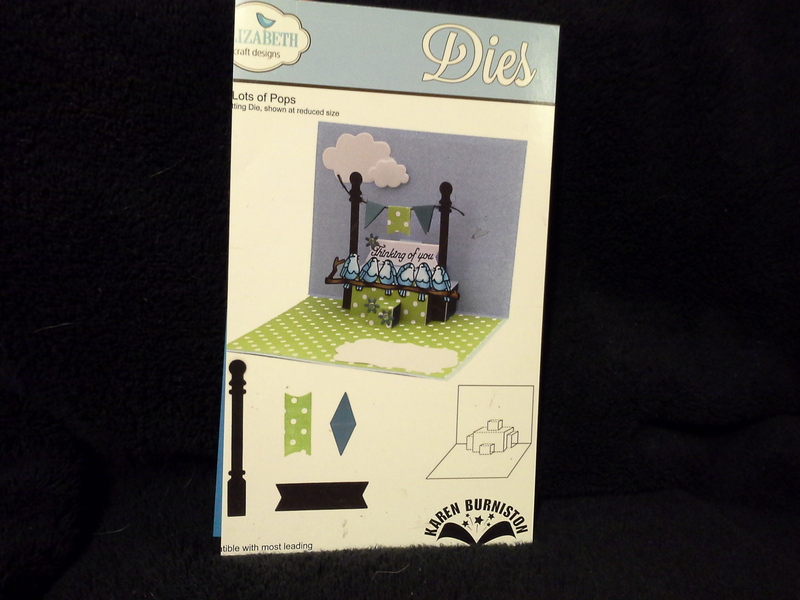 Again you can see in the picture the “extras” included in this die set is the adorable pole and banner dies. This is a new version of a pop up, for me anyway. It’s where, as you see in the photo above, when the card is opened the feature image pops up in the middle of the card. I then found a “Print and cut” image in the Silhouette shop of these cute little houses. Most of the images in the Silhouette shop can be sized any way you want them as long as the size you choose is not larger then 12″ x 12″ because that is the size of the cutting mat. 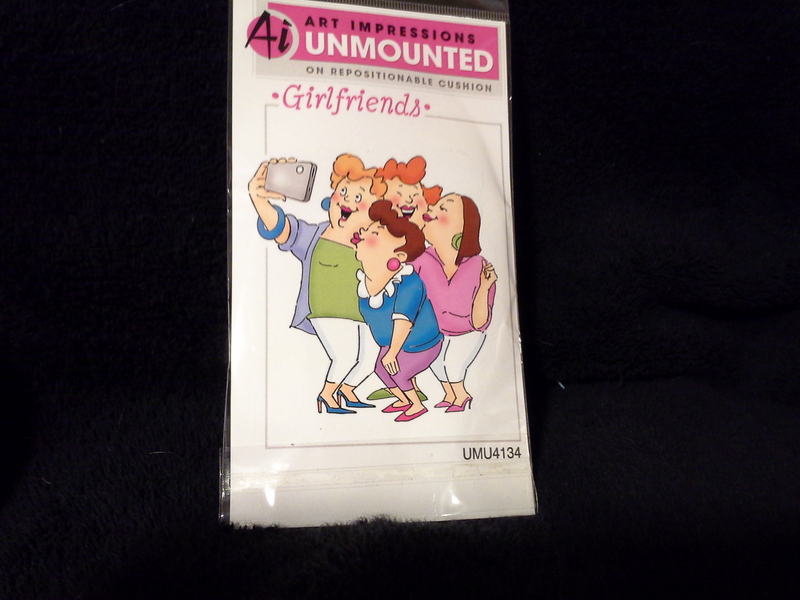 The image of the four ladies is a stamp from Art Impressions called “Girlfriends”. I stamped the image on white cardstock, colored it with Copic markers almost exactly like the package and then fussy cut the image out. (“fussy cut” just means to cut all around the image. You’ll find this term used by a lot of paper crafters. The garden was created by first cutting a large circle of white cardstock. I then used the negative space from a “background” image from Silhouette called “cobblestone” as a stencil to make the path. The flower garden was a smaller circle cut out of a Silhouette background also. Then I glued the garden circle over the path circle. I cut the top of the two glued together circles to fit in front of the foremost level of the die cut. The grass around the outside of the path was created by using the negative from a grass image from Silhouette I cut for behind the wrought iron fence as a stencil and then with a dobber just stamped in green over the stencil and kept moving it until the space was all covered. Do this to the bottom of the card before you glue your garden and path circles to the bottom of the card. Duh! I decided the garden needed dimension, so I cut some tiny little red flowers (also a silhouette file). I then used my Susan’s Garden Tool Kit to make the petals curve up and then used Crystal Lacquer on the black center of the flowers to make it shiny and give it more dimension too. I know, I’m crazy! The wrought iron fence is a die from Memory Box called “Estate fence”. A really important tip: Cut out all your elements to your little scene before assembly. Often, I’ve found anyway, that what you thought would work doesn’t. You don’t want to glue anything in place until your certain that all the elements work together before you start to glue them in place. On all the “pop ups” I make I first cut the pop up card base first and then audition all the elements by leaning them against the pop levels. Many times this has saved me from making a disastrous mistake. 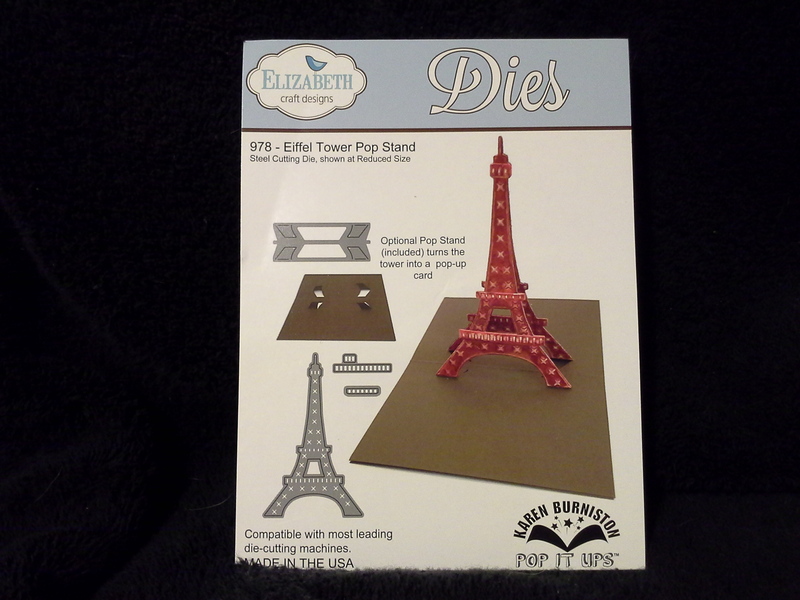 The best resource for how to use the Elizabeth Craft Designs Dies is video tutorials from Karen Burniston on YouTube. And, while your at YouTube check out “Susan’s Garden” videos on making flowers. Do this at your own risk because you’ll want everything they show you. But hey, Christmas is right around the corner!